It’s been a minute since we’ve heard from Salary. We wouldn’t call them a ‘big band’ per se, but they’ve sure got a lot of members. We’ve finally received the first taste of their second record, in the form of single Polite Rebellion. 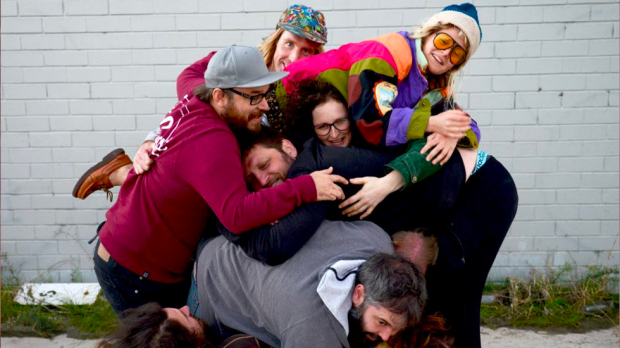 Salary will be performing pieces from their forthcoming album at RTRFM’s Harbour Sundays on February 17 at the West Australian Maritime Museum in Fremantle. Frontman Sean Gorman caught up with TAYLAH STRANO. May 2017 you released Upside Down Island – you’ve had a little bit of a shuffle in the band, it feels like there are new members since that record came out? So we’ve still got all the same members from the first record but we’ve added Thea from The Tommyhawks on flute, also James Dolan played some keys – He plays in the Galloping Foxleys and a few other bands. We had Maggie Edwards from Tasmania, she was just in town [at the time] and did a bunch of backing vocals. How many people’s that now? I think that’s about 12 now. That’s a lot of people! How does it look when you come together to jam and discuss album things? Everyone’s just in a room saying things, and then I just let it wash over me and then make my own mind up. That’s how this single came about though, you wrote the song, and then from there people collaborated on what the instrumentation will be like? Yeah we just get in a room, I play it, and then everyone just writes their bits. We just keep playing it till everyone’s figured out their parts. It’s kind of weird, it just falls into place if you let it. Yeah. I think a lot of the people in the band are songwriters so I guess they’re good at making parts that fit the song, not necessarily being virtuosic or anything like that. I think everyone’s mainly interested in making the song cool. Polite Rebellion is the new single, it’s almost like this moment of clarity for Salary? I think everyone else in the band was really happy with this song, I guess that’s why we put it out as the single. This album is a lot more consistent and probably less frantic than the last one. It’s more steady or relaxed. Yeah, but also being vulnerable as part of that. Trying to be vulnerable and more assertive when you should be, to be better to yourself and better to people around you. It’s that thing of polite compromise? It’s about not being polite. So if you’re going to rebel, just do it. From not doing that and then seeing the consequence. Yeah, exactly. Part of it is also, you’re conflicted in a way. It can be difficult because there are all different forces in life that push you. Are there undertones of realisation and positivity in the rest of the record? Kind of. A lot of it, I didn’t realise it, but it is about that. Are they songs you’ve written kind of recently, or songs that have stuck with you for a while? I guess they’ve been building up over the last few years since the last record.